We’re at our final stop on the Cincinnati Preservation Association’s house tour in the North Avondale neighborhood. And I think I saved the best for last. 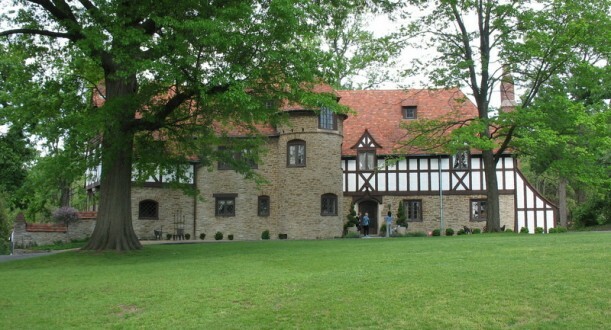 The Mack House, a 7,000 square-foot Tudor Revival-style mansion, was built by Jacob Mack in 1931, and featured a round half-tower. It looks like Rapunzel should be peeking out from those leaded-glass windows on the third floor of the tower, but the original owner’s mother-in-law actually lived there, and as far as I know, she was free to come and go as she pleased. The current owners–Henry Luniewski, a drum tech for the Dave Matthews Band, his wife Julia, and their three young sons–are only the second family to have lived here. We were able to see the original floorplans drawn in 1929 by local architect John Henri Deeken (1888-1948), who designed dozens of the finest homes in the Cincinnati area during his career. The house was built 1929-1931 and the artisans, about 30 of them, employed before the stock market crash, were kept on until the house was finished. Upon completion, the artisans wrote letters – many light-hearted – about their various tasks and expressing gratitude for the employment during difficult financial times. The attention to detail in the house was amazing. There were built-ins everywhere. On the third floor was an entire room for the family’s steamer trunks, and there were wood “lockers” meticulously labeled so that the servants knew where everything should go. The original labels, scrawled in a feminine hand in pencil, are still there (“summer doilies,” “white dinner napkins”), and we had fun reading them. Speaking of the servants, their wing was on the second floor and they had their own back staircase leading down to the kitchen. The delineation between the family quarters and servants’ can be seen when the hardwood floors change from expensive mahogany to simple pine. When they were studying the original floor plans, they noticed that there was supposed to be a fireplace in their son’s room. They tore down the plaster and found it hidden underneath. 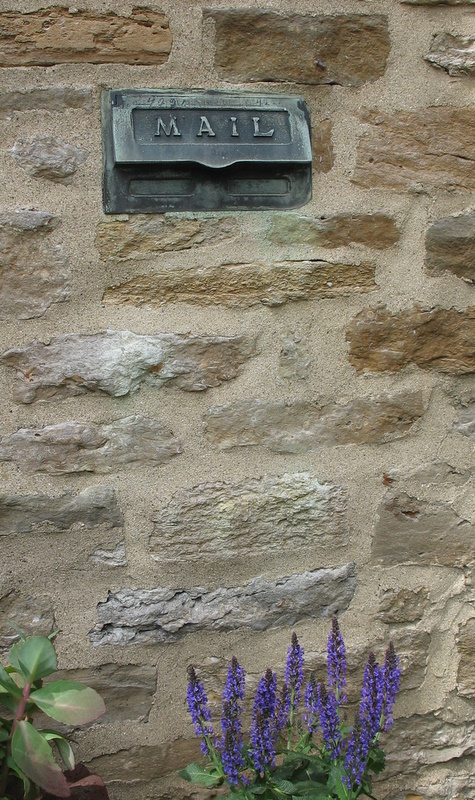 It has since been restored and is the focal point of his room. I was just in awe of the amount of work that this young couple has done in two years. It was in such bad shape when they found it that the first time Julia plugged a vacuum into the wall, flames shot up the cord. To see a slideshow of the home’s interiors, click here. 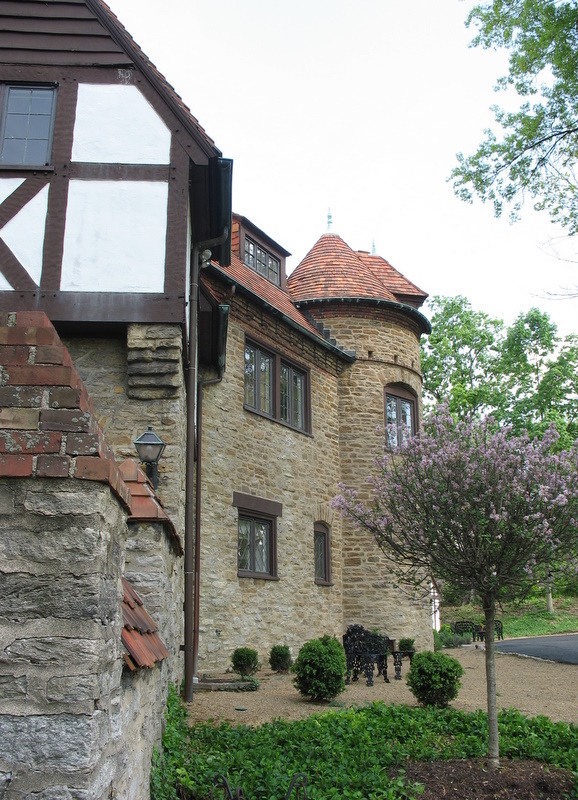 To read the Cincinnati Enquirer’s article about the Mack House, click here. All exterior photos of the house are mine. Scans of the interiors via Cincinnati Magazine. 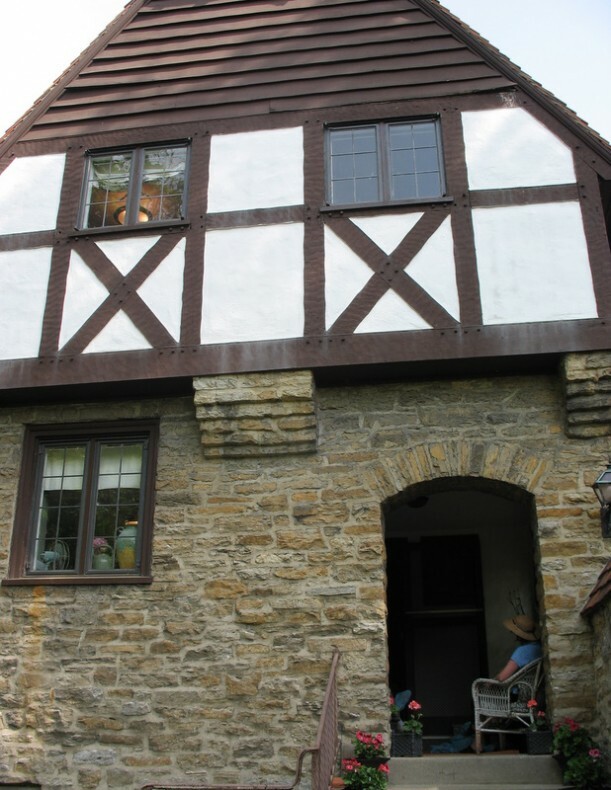 Tudor Revival-Style Home of the "Cantaloupe King"
BTW… I have a few ideas about how the book thing started. I think the reverse placement and paper covering thing started out as a necessity. When visually merchandising photo shoots or displays you often acquire large amounts of books cheap (library or school closes,yard sales etc.) and they are not always in great shape. So turn them around and you don’t see the worn out spines. If you have a modern decor and books with mulit colored spines don’t gel with your color palete cover them in paper to minimize the amount of colors. You can also make an artistic or “avante garde” statement by arrange them in a sculptural way when they are are the same color. Ok enough of my “two cents”….am stepping of the soapbox now….hehehe. This house is very unique-looking and like you said it does look like a rapenzul home! I love your blog! Wow, that was the best and I adore Tudor Revivals. I would be happy just living in a corner of that house…preferably the corner with the window seat. Love, love, love it! My favorite picture is of the little boy reading in the window seat! Gorgeous home, but way too big for my tastes. Backwards books? IMHO, that’s just ridiculous. I love books and I also think they add a lot to a home, but I organize them by subject and appreciate the haphazardness of how that looks. This home is absolutely beautiful. I love it that they have decided to restore rather than to remodel. The original details were done so well that it makes it timeless. I don’t see the sense in putting books in backwards either. I love books and the way they look, worn spines and all, so I’d much rather be able to see them. Wow…love the styling – thanks! This house is incredible. I like the architecture myself. Tudors can be really “choppy” inside, with small rooms, but this one is magnificent. I particularly just love all restoration of the original detail. The slideshow was really interesting. I wonder if the kitchen butcher block is original – did anyone else notice how worn and used but loving cared for it is? And the pan slots inside that kitchen cabinet? BTW, I also wondered if the stained glass window in the slideshow that reads “Ohne Dich Tod” (Without You, Death”). Wow – This house would be perfect for my husband and I – I love stone and he loves that german look with the stucco and beams on the exterior! I LOVE the interior (although I really don’t think I could handle 7,000 sq ft of house)…MAYBE 2,000-3,000. The owners have done SUCH a good job with this house I love everything I saw. I love the arched door ways and the hallway towards the end with the angled ceiling. I love the farm sink in the kitchen and the bathrooms…and the colors and the structure itself. There are a lot of unique, awesome niches in this house. I think it’s really great that the owners updated the house but didn’t “remodel” it or change the style…but it doesn’t look outdated to me. It looks comfortable and lived in. Wow I wish I could see this house in person – you are so lucky! 🙂 I’ll have to save this house as my favorite of all time. Beautiful! I can’t believe they scooped it up for that price!!! Granted it needed probably that much and more in restoration, but still! I’m so jealous that you got to see it in person. BTW, my son would have flipped–he loves DMBand. house every day. I would love to go exploring in it. This is beautiful! 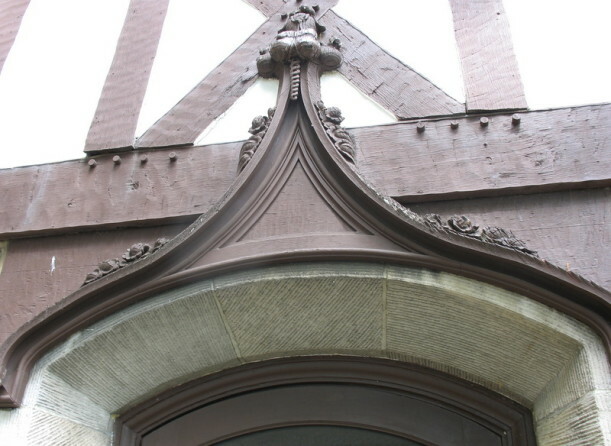 The over the door detail reminds me of Biltmore. Somewhere in my archives I have a photo similar to yours, of that detail. It was taken at Biltmore, last December. I’ve enjoyed this series, every step of the way! This is a truly amazing home…the best of the best, I love it. Lovely insight and pictures of this work by John Henri Deeken. 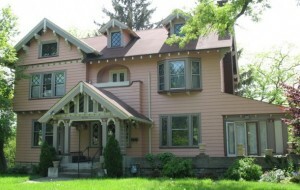 He also was the architect of “Ambleside” (1928) on the Nat’l Historic Register which was most recently owned by Marge Schott and is being marketed for sale in mid-2009. 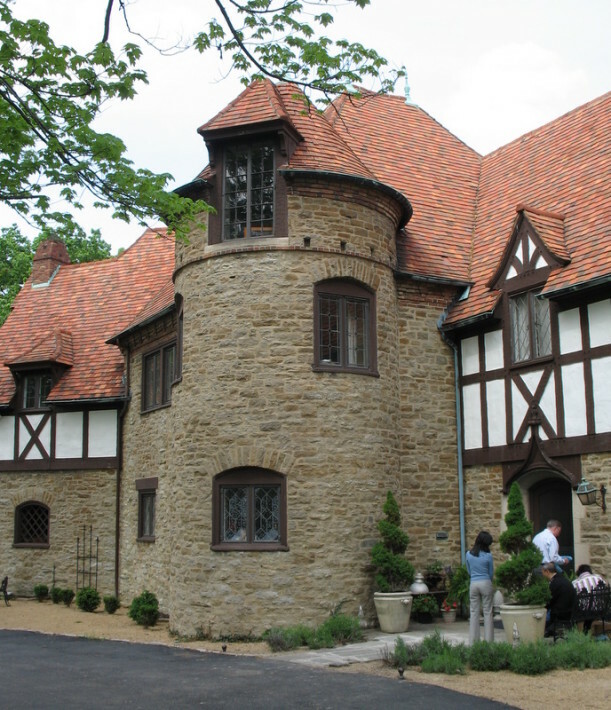 Deeken certainly had a grasp of the seductive feel of a stone tudor house and found some of the most skilled laborers to make his designs happen. Hello! What a fun site. My future “host daughter” found this when researching our family from Slavenia. Thank you for your beautiful article. I am happy you enjoyed your time in our home. The books in backwards was a wierd happen stance. I had never thought to do such a thing, but when we were putting up books we bought in a bundle at auction, & had unearthed from years past, we saw swasticas (spelling???) on the binding. As a Buddhist I come across the same symbol in various temples so I know it has various meanings, but I was uncomfortable showcasing the binding in our historically Jewish home. When I flipped the book instinctualy, I was delighted in how aestically pleading the textures & colors of the pages were compared to bindings. I have never liked the glossy jackets, & with both little boys and dogs it’s rare for a jacket to stay preserved in our house anyway.